The device is considered to be of high-quality flooringmandatory event that determines the reliability and durability of the future structure. Conventional concrete structures that have not been special treatment, not ergonomic, in such areas dirty and dusty. If the strength and purity requirements are important to you, then it is advisable to lay plastic or liquid industrial flooring. 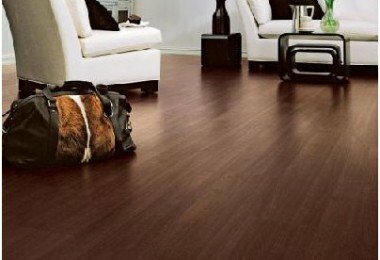 Industrial flooring is a constructionstructure on which the entire manufacturing process and the activity of people. Structures and Materials industrial floors assigned, based on the load of the stored load, the intensity and the type of mechanical stress outdoor vehicles and dust separation in accordance with the regulations. General technical requirements that applyfor industrial floors, are as follows: construction should resist bending efforts of compression and stretching, impact and abrasion. The floor must withstand aggressive chemical factors - low or high temperatures, water, oils, alkalis and diluted acids. 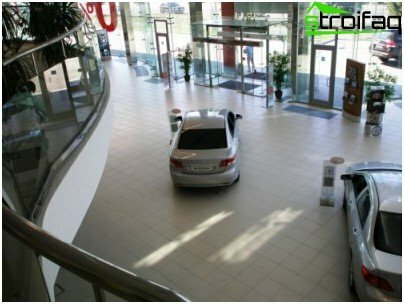 According to the technological requirements of industrial floorIt must have smooth, but not slippery surface, as well as provide a comfortable and safe movement of vehicles and people. In addition, the floor during operation should not have harmful effects on the health of people, that is the design should not release hazardous gases, dust and odor. 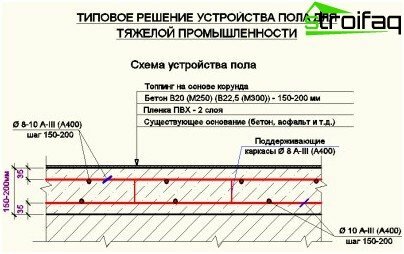 In the industrial floor surfaces should notgenerated static electricity, and in some cases the floor has to be a dielectric. For industrial floors are nominated and operational requirements - the material should allow for the possibility of repair and resist the quick and easy cleaning. Industrial concrete floors composed of severallayers. 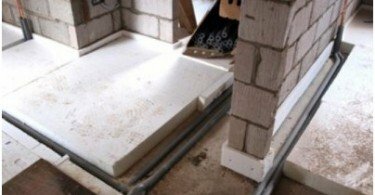 Subgrade acts natural or artificial support floor, which takes all the loads that are transmitted from the floor. Next is training - the underlying layer that distributes the load on the subgrade. 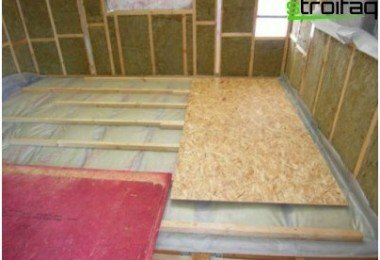 Insulation is needed to reduce the overallthe thermal conductivity of the floor and sound insulation prevents penetration into the room and from the impact noise. Waterproofing - a layer that prevents penetration through the industrial floor of wastewater and other fluids, and also protects the entire structure from the ground water. The next layer is called the industrial floortie. It is used for leveling the surface of the underlying layer, or covering, the covering is required to impart a predetermined inclination to cover various pipes and distribution of loads of a non-rigid underlying layers. Interlayer is called the intermediate layerfloor, which binds to the underlying coating layer or coating used for the elastic part. The coating layer is an upper floor, which is directly subjected to operational stress. Industrial floors are of several kinds. Concrete floors with a reinforced upper layer have established themselves as a strong, reliable and dust-free surface. Used for industrial buildings, garages, car washes and service stations. Industrial floor fillers are not afraid of the activemechanical and chemical influences. They are aesthetically more attractive than the toppings. 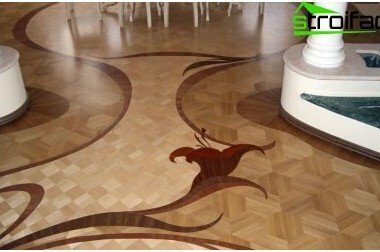 Similar designs are widely used in buildings for public use - floors for office, shopping center, administrative building. Polymeric poured floors due to its resistance to aggressive environments found in the food and pharmaceutical industries. 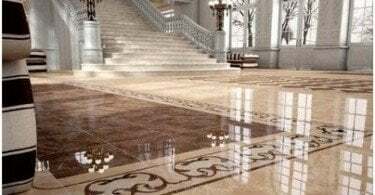 Monolithic mosaic floor that is made ofmagnesia concrete is perfect for high intensity and heavy duty operating conditions. 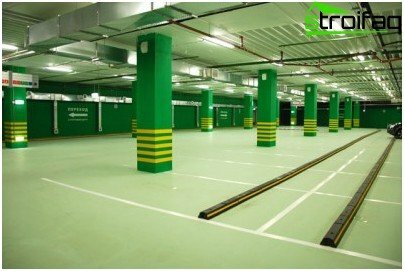 Magnesia floors are used for industrial buildings and structures of various industries are high-strength seamless flooring for warehouses and autoparkings. Mounted floors are used most often inadministrative and office buildings as well as buildings for public use. This office floors, floors for shops and retail space, cafes and restaurants, auxiliary and technical premises. If you are planning to build a newindustrial building, is well thought out styling and a device of industrial floors. Traditionally, this kind of work requires great accuracy during assembly and considerable experience in the construction field. Technological process - not an easy task. Industrial concrete floors can be laidon top of the soil or the existing concrete base. Laying the concrete floor on the ground begins with a careful preliminary compaction of soil, which is carried out across the area of ​​a premise. 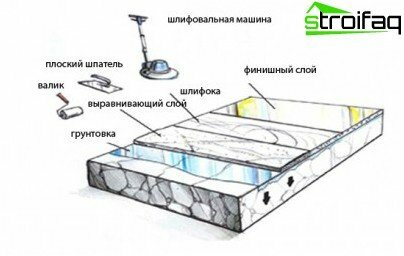 According to the technology of the next step is laying sand cushion. Its thickness depends on the types of soil. On top of compacted sand placed crushed stone pillow. If industrial floors are arranged on topthe old base, it also requires careful preparation of the base. It is usually to inspect for cracks, which should be expanded to fill a special repair structures. If the state does not allow the foundation to carry out repair work, it must be removed. The substrate should be leveled, if it has a sharp vertical drop. The presence of waterproofing concrete floor technologyIt depends only on the initial project. 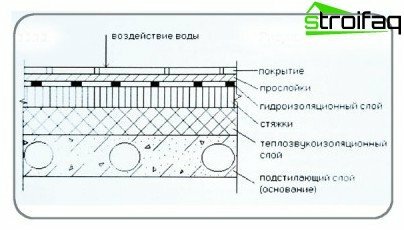 The process is carried out using the polymer membranes or bitumen waterproofing. If there is a floor in a room filling a large area, the area should be divided into the "map" - a particular size rectangles that are defined by a step of columns. The optimal size is 6 meters. On the prepared surface should be placedreinforcing mesh, which applied between the cards with the required overlapping and sealed with a soft wire. Then he will spend pouring a concrete floor with a view of the mobility of the mixture. 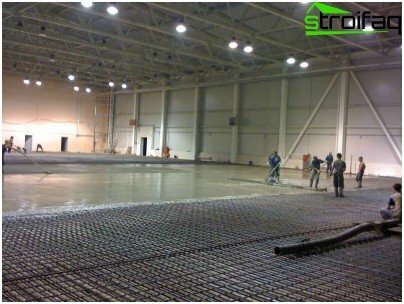 Device concrete screed Industrial floorIt requires a careful approach to the leveling that should be carried out with the help of screed - special tools. At this stage, adding concrete allowed. Next is to perform grouting concrete surface and apply a topping. Used car betonozaglazhivayuschaya. First you need to hold a primary sweepthe surface is then sprinkle topping. It is important to distribute the material as uniformly as possible over the surface of the concrete screed. Once topping absorb moisture and the surface darkens, should produce a rough grouting of industrial floorings - immediately distribute the remaining topping. The finish grinding is to take place in that time,when a person's feet will leave a trace on the surface of the screed depth of 2 mm. This procedure uses all the same betonozaglazhivayuschie machine with finishing blades, which can gradually change the angle. Construction of concrete industrial floors come to an end, when the floor is concrete, characteristic shine. 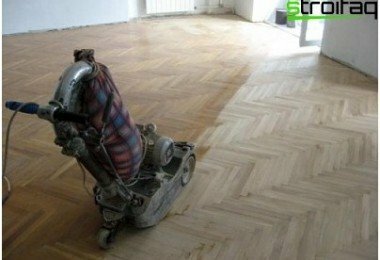 If desired, you can apply the de-dusting floors and hold cement concrete floor. As seen, concrete floor unit is a specific time-consumingprocess, however, pouring concrete industrial floor with their hands still feasible. Following the instructions, as a result, you can get excellent coverage that is suitable for any industrial or commercial buildings.